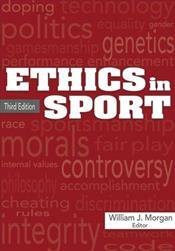 Ethical and moral dilemmas in sport have not diminished since Ethics in Sport was last published. The need to understand and confront such issues is at a premium, and this latest edition of Ethics in Sport will ground readers in the issues and the stakes involved. Ethics in Sport has long been known as a go-to source that tackles the moral and ethical issues in today's sport culture. This third edition retains many of the previous editions' thoughtful and timeless pieces, which speak directly to current issues, while adding 17 new essays to the mix. The inclusion of these new essays reflects the increasing sophistication of the philosophy of sport literature as well as the growth in the field. Together, these essays from well-known authors give students classic and contemporary views of topics where sports and ethics collide.